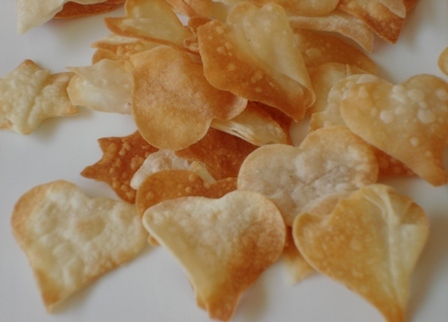 Say “be mine” with heart shaped filo chips this sweetheart’s day! 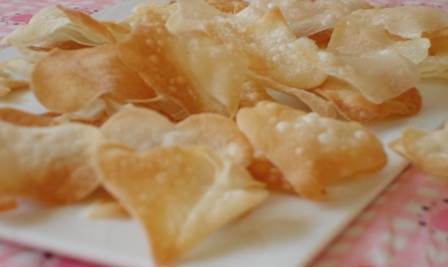 Cut the filo with a heart shaped cutter and place them into a parchment paper covered oven tray. Brush each filo with hazelnut oil. Bake in a preheat 180° C oven until golden to light brown. Serve at once and pamper your sweetheart! Have a very romantic day!!!!!!! 100 gr pistachio paste preferably from Antep’s Güllüoğlu or ????????????? ???????? ??????? Melt the bittersweet chocolate with bain-marie method. 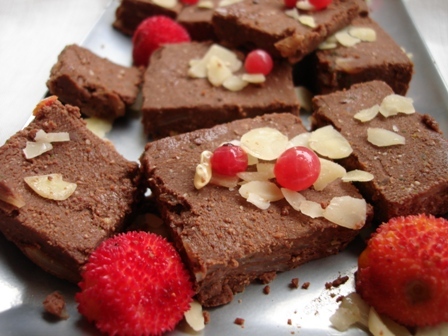 If you don?t have a bain-marie chocolate machine simply put water in a thick bottom pan. Inside this pan place another pan with the couverture chocolate. Chocolate needs to be melted at a very low temperature. When the chocolate melts, add cheese and stir well. Then add pistachio paste. Whip the cream and add it to the mixture. Line a rectangle tart tine with grease-proof paper. Spoon the mixture into the tin, cover top. Chill in refrigerator overnight. 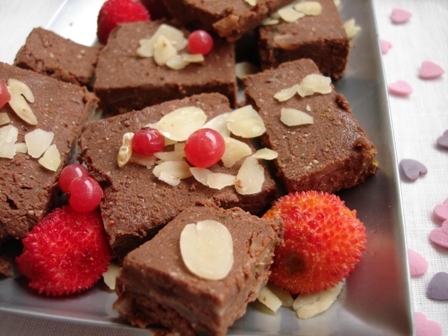 Cut the cold cake into pieces, place them into serving plate. Dust heavily with chopped almonds. 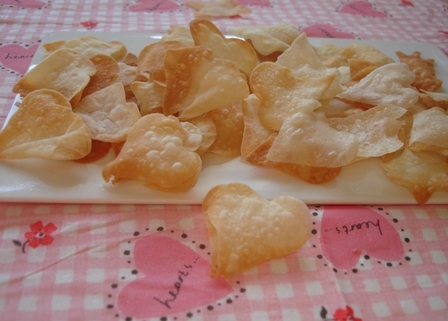 Here is a savory Valentine’s idea to celebrate the day and then I’m sure it will be one of your favorite! Peel the potatoes and slice them very thin. Then cut them with a heart shaped cutter. 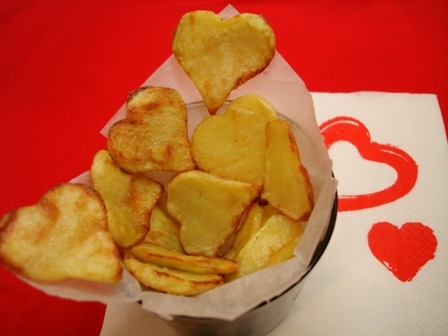 For low fat; instead of deep frying, place them into an oiled oven tray. Bake the potatoes in a 220° C oven until golden brown. Drain on absorbent paper. Sprinkle with salt. 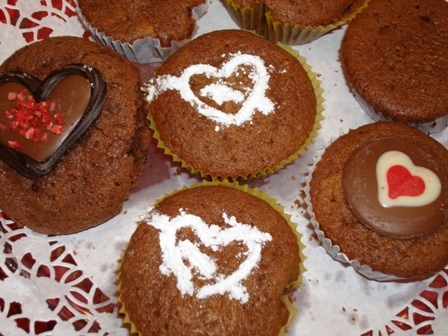 Thanks to global marketing efforts, Valentine’s Day is celebrated all over the world. 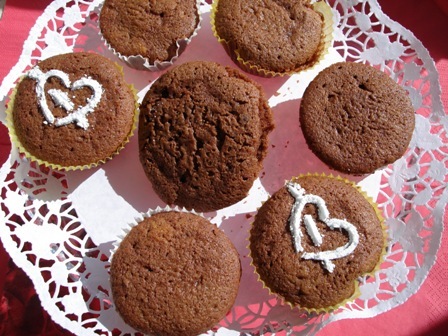 In Turkey, Valentine’s Day is called “Sevgililer Günü“, which translates into “Sweethearts’ Day”. While we are getting on for the day,here is the right recipe for love and affection, enjoy it! Whisk eggs and sugar. Add butter and beat it. Sift together dry ingredients, add to egg mixture and mix thoroughly until it is smooth. Finally add chocolate drops. Line a muffin tray with paper muffin cases and pour each case half of the muffin mixture. 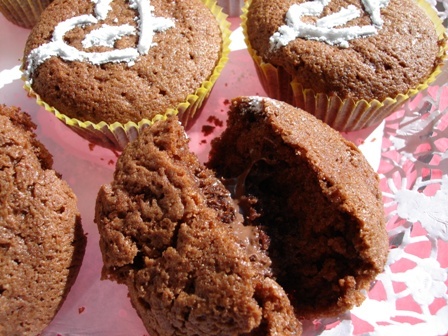 Put 1 t. of Nutella for each muffin and pour the rest of the mixture to the cases. As the Nutella will be in the middle of the mixture, when cooked it will be a wonderful happiness. But don’t fill the muffin cases completely, because it will rise! Bake in 150° C pre-heat oven for 30 minutes. Makes dozen. 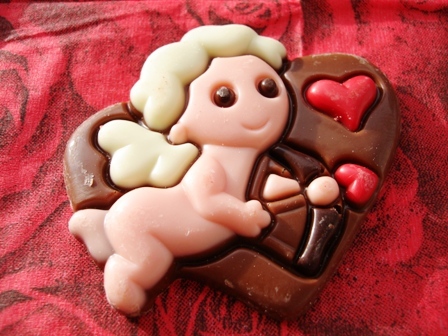 You are currently browsing entries tagged with sweetheart’s day at Aegeaneating.